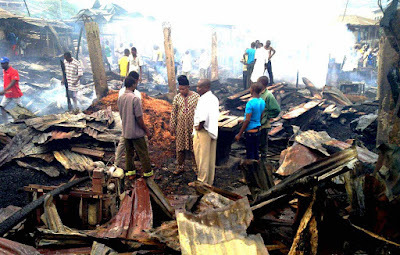 Mr Gbenga Fasoro, the Secretary of the traders’ union in the popular Ibadan plank market, Alaro, in Sango, where the December 25 fire incident occurred said traders didn’t lose N250m to the fire incident, but lost times four of with which has been approximated to N1bn. Gbenga said the fire didn’t occur at the plank market but a nearby house but someone made it spread to the market when he threw a cooking gas cylinder into the plank market. Gbenga said he had come to visit the market for inspection when he heard a loud explosion and quickly went to his car to pick his fire extinguisher, but sadly the fire had gone beyond what that could control. 250 shops, generators, equipment and goods were all destroyed in the inferno.